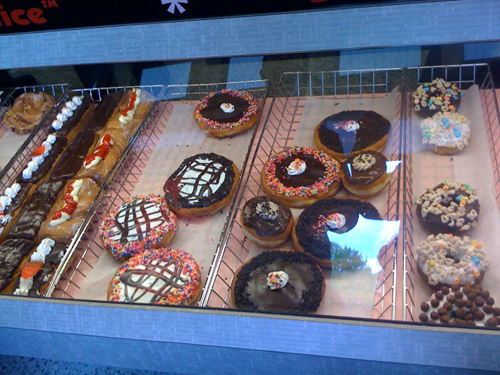 Aaron and I went to Donuts Delite for breakfast and there were the usual tasty looking donuts. I noticed they had some with breakfast cereal on them (on the right). 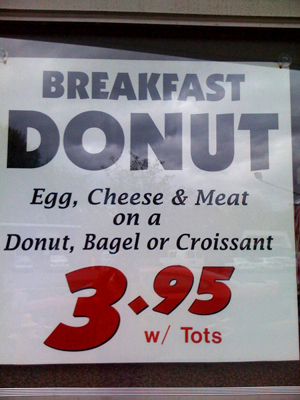 We also noticed they had a breakfast sandwich... that you can get on a bagel or croissand OR A DONUT! With tater tots! I am down with the tater tots, those make total sense. They are just like a hash brown rolled up into a... tot. The donut sandwich? I think we will have to try it and report back on AaronSaysJennySays blog! That makes me think of the hamburger Paula Deen makes with a donut.